Having tied-up the feverish Fenton, Charles sets off in search of help — both medical assistance and directions to Fenton's lodgings where the notes Charles wants so desperately to see are kept. 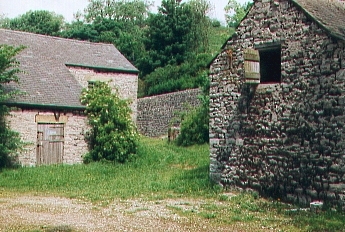 Description: The two barns between which Charles rides are in the grounds of the Upperdale House Bed & Breakfast hotel in the heart of Monsal Dale. The lean-to roof on which Sanders and Jim are working is just to the right of this shot. Where is it? : The hotel is situation at the junction of the only crossroads in the centre of the valley. Where's the best vantage point? : While the area can be viewed from the public roadway above, and — at a distance — from the roadway to the side, Upperdale Farm itself is private property. What about access? : The proprieters of Upperdale House have been willing, in the past, to grant brief access to small groups of fans wishing to view the area — who have knocked at the door of the main house. Anything else? : Fenton's house; the bridge under which Charles evades his hunters; the house from which Charles takes the bike; the lane along which he suffers his puncture and the barn in which Charles tends his wound are all very close by. Upperdale House offers both B&B and self-catering accommodation. Telephone 01629 640536 for details. 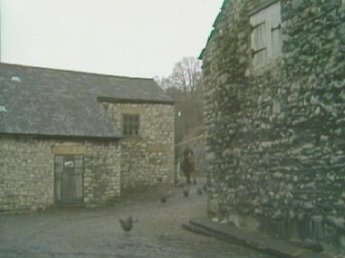 In 2000, the area through which Charles rides once again became a run for chickens and a low fence now crosses the scene.